Hopefully you will have found our 2014 advice and taken a look through and also considered your annual cures for 2014 to ensure a smooth year ahead, if not please follow this link for more details. From 7th November to 6th December 2014 is the tenth month of the Jia Wu year (Yang Wood Horse year) with the ruling energy of #8 in the central grid. Centre – The centre is a lovely area for the month of November 2014 and you should try and place some real quartz crystal in the centre of your home or office this month; you can also place a wind chime here made from crystal or anything made from an earth element. A crystal ball or globe is also very good for anyone in business or students. North – A wonderful sector for couples as this is a good sector for building relationships. Marriage may also be a possibility when under this romantic influence of the month. This is also a good sector for those who are preparing for exams. If your bedroom is in this corner of the house, place something blue, e.g. throw over, rug etc, in the north corner of the bedroom. This is a good sector for those who are looking to tie the knot or for whom romance is on the agenda. The energy of the month is very conducive for building long term relationships. You can place a set of mandarin ducks or rose quartz double hearts here to help this romantic influence. This is a lovely area for those who work in the creative field such as writers, artists to architects. If your office or study is in this sector of the house or office, the influence of the sector may propel your ideas into reality. This is the month to work hard and pen ideas into proposals and make use of this wonderful influence for future success, especially so for Dogs, Roosters and Rats. Romance is also dominant in this sector, so for those who occupy a bedroom in this corner of the house and are single, enjoy. This is also a good sector for those who are preparing for exams. West – Those who have a front door, office or a bedroom in this sector of the property, may find that fame and recognition are coming their way this month. Possible joint ventures or new business plans may appear when least expected. To enhance this month place a brass Dragon here or a metal wealth pot. To enhance family and romantic relationships, you should place a wooden Wu lou along with a brass Dragon headed Tortoise if you have one. East – Although this area is visited by a fairly auspicious monthly energy it is held back by the negative influence of the annual #2 star. Just make sure you have your annual cures in place as this will take care of this part of the home or office. If your front door is in this location of the property, the month’s influence may benefit those in the real estate business or those trying to sell or buy a house. It is also a good location for those looking to venture into a new partnership or business. Do not use red in the general décor in this palace. Metal cures should be in place to negate bad monthly stars during the year. Northeast – Those with main or back doors in this palace must take extra care this month. If your kitchen is in this sector of the property, take extra care when preparing hot food or handling hot equipment. Possible fire hazards are possible in this sector of the house. If you spend a considerable amount of time in the kitchen, you must be aware of the possibility of being burnt or scalded. Cook or work with care and do not rush. Accidents usually happen when we are in a hurry or not paying due attention to what we are doing. Be very attentive in not leaving lit candles unattended in this area of the house. Keep matches and lighters out of reach of curious little hands. The month’s influence may spark their curiosity out of the blue. If there are external poison arrows, for example, sharp roof lines, sharp images or unfriendly structures pointing at your property from this northeast direction, this may bring fire accidents. Place a Ba Gua mirror outside if your main door is located here. 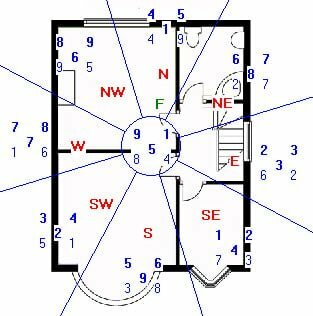 If the northeast part of your home or office is a bathroom, cloakroom, utility or other similar less important room you do not need to do anything. Southwest – The negative aspects of the visiting monthly #5 yellow may bring obstacles in business or at work as well as illnesses affecting the ears, kidneys and the spleen. Have extra patience when projects or ideas take longer to materialise than you expect owing to the obstacles placed in our way by the monthly #5 Yellow. Children or elderly people who occupy a bedroom in this palace may suffer ear infections due to colds especially with unsettling weather such as we have been experiencing in the past few weeks and with the winter months ahead. Be aware that they are more susceptible to this influence and take extra vigilance in dressing them appropriately. You should have your annual enhancers in place here for the #1 in the southwest palace; this would be the appropriate cure for the visiting 5 Yellow. If you have not, I would suggest placing some metal decorative objects (nothing triangular in shape, sharp or menacing looking) in the southwest corner of the room. Avoidance is the best cure for this combination of qi. If you cannot avoid using this room, make sure that metal cures are in place like a Wu Lou and/or six Chinese coins tied in a row with red ribbon. Use metal such as gold, copper or brass. You can use whatever metal objects you have got handy in your house, but do avoid objects that are sharp or menacing looking. Do not place any red, pink or orange colours in this area or anything triangular or square in shape and do not burn candles. If you are living in a country where the weather is still hot please be very careful where placing your fan, avoid placing in the southwest, northeast and south this month, as it will activate these inauspicious areas. South – Those with main or back doors or bedroom in this palace must take extra security measures as burglary or robbery is indicated. If your bedroom or office is located in the south, be careful of what you are signing, especially with contracts, as the influence in this palace carries with it possible law suits and arguments especially with partners (romance or business). If the south part of your home or office is a bathroom, cloakroom, utility or other similar less important room you do not need to do anything and do not read further. If the south is a main door, bedroom, lounge or any other important room you need to take care. For my home as an example the south is where my office is located and I have purposely made sure I am out of the office more in November, obviously we cannot control it completely as people will still be calling at my office and I will have to use it at some time, we will just use it less, AVOIDANCE IS THE BEST CURE. You can place a piece of red cloth here for the month to try and calm things, you can introduce this colour with doormats, rugs, bed covers etc, remember the negative part is just a passing influence so do not start repainting the room red as next month you will not want this colour, as the red if left in place in December will cause you many problems and this is why you should check back each month. Southeast – For office units located in this sector of the building, keep an eye out on your business accounts or financial dealings with others as the month’s influence indicates possible embezzlement and fraud. This is especially so if your own office is also located in the southeast sector of the unit. Spend extra time in reviewing important documents before signing them as money can be lost through law suits and betrayals. For main doors located in the southeast sector of the property, office or shop premises, take extra security measures during the month of November. Make sure windows and doors are double locked before leaving the premises. If your bedroom is in this sector of the house, take extra care on the road. Minor traffic accidents are likely and keep your belongings, briefcase, handbags etc close to your side. The influence also indicates potential money loss through thievery. Use blue bed furnishing or place something blue in the southeast sector of your house to calm interaction. Do not worry about the southeast if this is a bathroom, utility or other les important room, you only need worry if it is a bedroom, office or other important room. Northwest – This being the location of the annual 5 Yellow, its malevolent influence is enhanced by the visiting monthly star #9. Those with a bedroom or office here may encounter minor setbacks or small losses due to poor health. However busy you are during the month, take good rest especially those with a history of eye or cardiac related illnesses. Please make sure you have some metal cures in place and at the very least a set of six Chinese coins tied in a row with red ribbon and a wu lou. I hope you all enjoyed reading and have had a great month.